Job most likely lived during the Patriarchal period, before Moses but after the Flood. He was a resident of Uz which was probably located in northwestern Arabia. He lived his life in accordance with God’s will, and was doing so when he was struck by multiple disasters and severe health problems. The main characters of the book include Job’s three “friends,” as well as Elihu, Satan, and God Himself. Many themes for the book of Job have been suggested, including: the reality of Satan in the world; the meaning of suffering; theodicy (or God’s justice in view of suffering); the nature of God; and faith. While each of these ideas is touched upon in the book of Job and worth thinking about, the real point of the book is seen in the climactic speeches by God Himself. When God showers Job with questions about the inner workings of the Universe, we see its intended effect in Job’s reaction. Job reacts by humbly bowing before the all-powerful, all-knowing, eternal, sovereign God of the Universe (42:2-5). Job recognized that to insist upon an explanation from God as to why the faithful suffer is to contend with God and to expect something we have no right to expect (38:2,18,21; 40:2,8,14; 41:11). 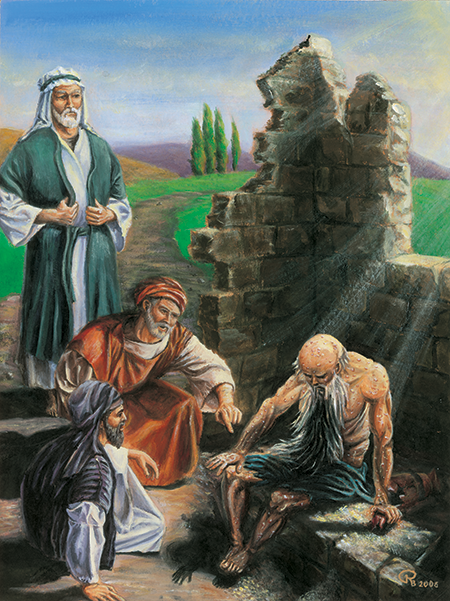 In other words, the book of Job impresses upon us the fact that the faithful child of God, when confronted by the magnificence of God and the reassurance that He has the ability to operate the Universe properly, can relax and endure the suffering of this life, knowing that God is near and dear. Indeed, at its deepest level, complete faith and trust in God requires no explanation for life’s troubles.